Even though they’re millionaires now, most of the 31 winners of last week’s $60 million lotto jackpot are not going to quit their jobs. 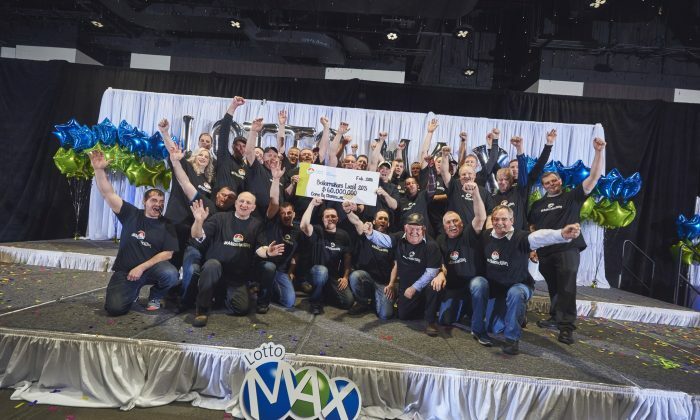 The winners of the history-making jackpot are boilermakers who work in construction at the Come By Chance Refinery in Come By Chance, Newfoundland and Labrador. Of the jackpot—the largest in the province and one of the top five largest in Canada—each winner will get $1.9 million. At a cheque presentation ceremony in St. John’s on Feb. 28, Sherry Moore Hickey—the only woman in the group and the one who had purchased the winning ticket—told those in attendance she had trouble convincing some of the others that they had won. After the good news sank in she got another bonus. “I was told by 30 men [including her husband] in one day that they all love me, so how many women have that happen to them?” she said. Hickey and her husband have already dipped into their winnings, having bought a new car and truck respectively. Of the winners—which include a husband and wife, father and son, and identical twin brothers—26 say they are going to continue working at the refinery. The other five retired immediately, reports CBC News, including Eugene Lewis, 63, who is happy to be able to retire. “It means a happy ending to my life, and then my kids will be looked after, and have a little few things that I could never afford to have,” he said. William Cantwell, 41, is among those planning to continue working. “We’re diehard boilermakers and when boilermakers give their word … we finish our job,” he said, according to CTV.